I don’t think the 400th post is a “thing” in the blog world, but in any case, here it is. 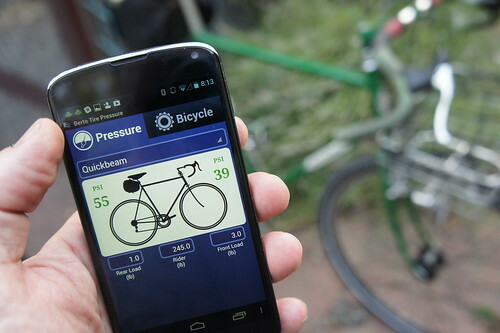 The Bike Snob mocked the Tire Pressure App on Tuesday, right after our big update. 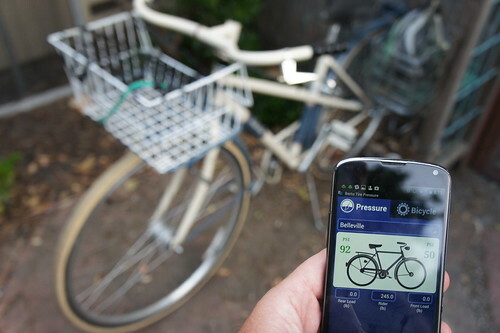 Go get the tire pressure app! It’s pretty cool, now. The update is visual and usability. The underlying function is the same; it should just be easier to get at. Here I am putting all my bikes in order. This overlay shows the list of bikes. The free version lets you make two bikes, the paid version as many as you want (we know you have seven). 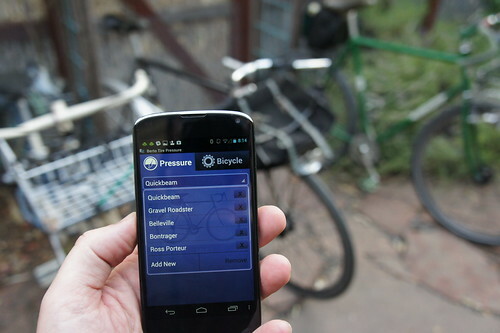 In the future, this screen may show pressures, as a quick reference. If you Add a New Bike, it will clone your selected one. Most people have slight variations of the same bike, just like they do jackets, so it’s a convenience. This is the Quickbeam, showing pressure, with me weighing 245. That’s 40 lbs of pizza and beer. Mostly beer. Say, 32 lbs of Bridgeport and Sierra Nevada strapped to me at all times. Hence the superwide tires I like. To get the right pressure (15% tire “squish,” for low rolling resistance and comfort), you need to know the width (actual, by measuring) of your tires, the weight of the bike, and the weight of everything ON the bike (you, your bags, etc.). You can’t trust any damn thing the manufacturer puts on the side of the tire. 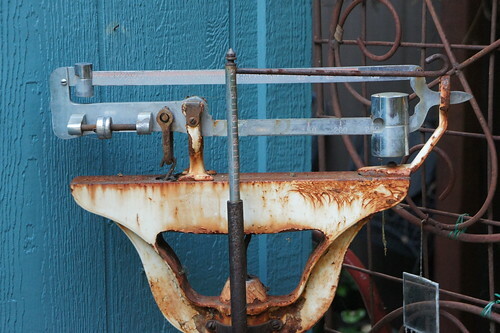 You are allowed to lie about your weight, though, since it’s an inexact science. The inexactitude doesn’t stop there. 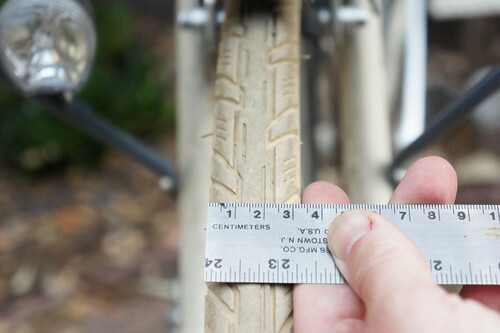 Tire casing plays a role – if you have handmade tubulars, or the equivalent, you can add 10% more air. Do the math in your head, it’s good for you. If you have terrible heavy utility tires, you may not care what the pressure is, but you can probably run them lower. So you measure. I actually have a monkey wrench I use for this operation. The giant wrench fits over the tire, it’s adjusted snug, and then you measure the gap in the wrench’s jaws. 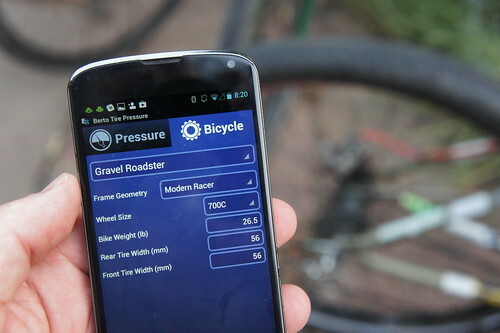 In the app, you input the width, choose the style of bike (different bike geometries have different fore/aft weight distributions), and tell the app how wide your tires are. It does the math for you, with an equation that fits against measured tire drop. Pump it up and ride away. This app may shock you – if you weigh 220 lbs and are running 23mm tires, you are going to see that you’re over-weighting your tires, and pumping them up to 120 psi front and back is still way under inflating them. They’re rock hard, so you don’t have any of the advantages of riding on a pneumatic cushion, and you’re still deflecting them for more rolling resistance than you want. Lose-lose. You should have 153 lbs in the rear, and 98 in the front. So 120/120 is overinflating the front, underinflating the rear. I’m unlikely to over-inflate 60mm Big Apples. In other news, I set my Strava personal best on the Tin Bar Stage Gulch climb this week, riding the Gravel Roadster with 60mm Big Apples. The bike snob tells me there’s now a “Gravel Racer” category of bikes. My 12 year old ate sushi and really liked it (mostly he eats fries), and I’ve been walking my dogs twice a day instead of riding to work. I Strava that, too. This is a excellent write-up of the app, Philip. The photos really make it pop. You should see if the Problem Solver guys would want to run it as a refresher. 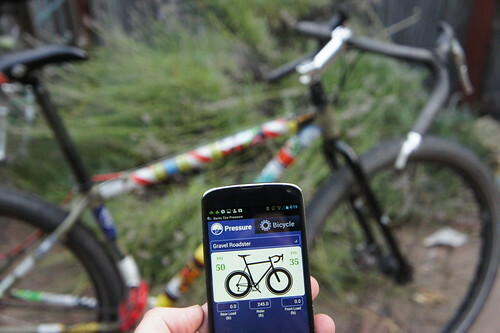 Or send a link to it to someone at Bicycling. Or maybe Surly, they have a blog. Thanks, Allan. That’s a good idea. I poked around the Bicycling site, and ended up hitting up Lennard Zinn on twitter, after reading his blog posts about tire pressure. If you know the fore-aft weight distribution, the “custom/obsessive” setting lets you just plug the numbers in. So, “yes.” I think the custom option could be handled a little more elegantly, but I only know two people who need that setting, and one of them did the math for the app. If you send me a side-shot of the bike, I’ll make a silhouette for a future release. You don’t own a caliper? I have a crappy one that cost a few bucks from the hardware store, but decent digital units can be had online for under $20 (personally I like tools that don’t need batteries if I have the choice, & I’m willing to live with the imprecision as a tradeoff for something that always works). I have one that reads in pica. Sorry. Free software, free content. If you tell me what you wish you’d said, I’m happy to paste it in.